Far, Far from Ypres is one of these collaborations that could only take place at Celtic Connections, The show was put together by Ian McCalman, who along with Stephen Quigg, Ian Bruce, and narrator Ian Anderson, kept the show moving through the years of WWI as seen through the experiences of soldier Jimmy MacDonald and his fellow Scottish soldiers in the trenches. I was particularly impressed by the singing, which combined powerful solos, robust melody and beautiful harmony and told stories of excitement and hope, suffering and endurance, humour and escapism, fear and disillusionment in the words of those involved in the horrors of the Western Front. …the singing was powerful, the sound quality was excellent and the words were crystal clear. On top of (or rather behind) all this, was the projection of images of the war by Pete Heywood, who managed to link appropriate pictures to the songs, while never taking away from the centrality of the music and words. Far, far from Ypres was a fitting memorial to the Scottish contribution in the First World War, and without being overtly political, it powerfully reminds us of the horrors of war and the individuals and communities touched by it. Thank you Celtic Connections for taking this project on board - the sell-out audience showed their appreciation with a standing ovation. For one night only, a group of singers and musicians gathered in Queen’s Hall to honour the fallen of the First World War. 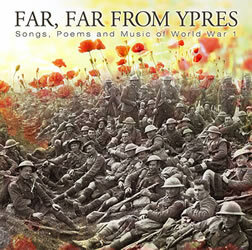 From this rousing chorus of talented performers, the packed house was treated to Far, Far from Ypres, a labour of love that left everyone with the profound sense of loss associated with the so-called ‘war to end all wars’. BBC Radio Scotland presenter Iain Anderson was on hand for narration duties, providing the links between the songs with appropriate gravitas and a bottle of Merlot kept to hand. As good as Anderson was (and he was very good), the real stars were the songs. While the show featured a broad range of music, by far the most fascinating were the trench and marching songs. These songs, sung to keep up soldiers’ spirits, provided a more vivid picture of their experiences than almost anything else. The performers conveyed all the emotion of the songs appropriately, either with sombre respect or a warm sense of fun. A standing ovation raised the roof of the Queen’s Hall for several minutes after the show had finished. It was a stirring end to a night honouring a terrible tragedy, one that left the entire audience moved and sombre, but strangely elated. What a moving concert and magnificent evening you and your colleagues gave us all with Far Far from Ypres at the Glasgow Royal Concert Hall on Friday evening. Friday evening. My congratulations to you and all those involved in this unforgettable production. It was a beautifully crafted show and there should be some way of letting everyone in the world experience it. Come back anytime. I was honoured to be there and enjoyed every minute. It was an incredibly powerful performance, both in terms of content and emotion. Class 3 On Thursday we began the long journey from Bunessan Primary School on the Isle of Mull to attend the performance of Far Far From Ypres in the Royal Concert Hall. Everyone of us agreed that it was well worth the journey. I was going to get in touch to thank you and the cast for a fantastic performance (once I had a minute to catch my breath). I think that the extent to which the children and young people were engaged is down to the performance and the great musicians on stage. What an absolutely brilliant, memorable evening. Drove back south today and still talking about it. Our thanks to everyone involved. A quick email to record our sincere thanks for putting on such an outstanding show on Friday night.